TED's X Games was a hit. 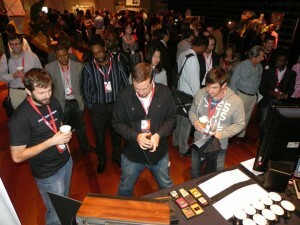 For those of you who didn’t make it to this year’s TEDxDetroit conference, you missed a really great event. Not least of all because you missed the chance to pick up a free “TED’s X Games” t-shirt courtesy of your friends at PUSH 22. So what exactly was “TED’s X Games”? As a sponsor, we were given a 10x10 booth and with two days to go, we decided that the right thing to do would be to put a vintage Atari 2600 and an old TV out on the table and just let people play. Frogger. Pac-Man. River Raid. Whatever they wanted. As we set up at 8 a.m. that morning, I wasn’t 100% sure it was going to work. But when I sat back at the end of the day and reflected on everything I’d seen and heard at the conference, I realized that creating a place at TEDx for people to just play, made so much sense. Because play is an “idea worth spreading.” And I think that’s why our booth was such a hit. Bob Sutherland revealed how playing every aspect of his business – from his products to his signage to his staff – has helped him build Cherry Republic – a multi-million dollar business built on the humble Michigan Cherry. Rob Bliss explained how playful events like the an enormous pillow fight and the launch of 100,000 paper airplanes on downtown Grand Rapids managed to slide past the usual red tape at city hall – with amazing results. Bobby Smith of En Garde! Detroit talked about using play to change the lives of youth in Detroit; teaching kids how to hone their skills as a fencer, while sharpening their minds with valuable life skills. And Dr. Anthony DeBenedet talked about the role that parent-child play (specifically roughhousing) has in the healthy development of children – turns out it’s absolutely critical. There were plenty of other great speakers on plenty of other topics, but the play theme really resonated with me because it’s something that, as an agency, PUSH 22 thrives on. When we play, we loosen up. When we loosen up, we’re much more open to new ideas. And isn’t that really what great advertising is really all about? BTW if you didn’t make it to booth, we did manage to save a few t-shirts. If you’d like one, drop us a message via our Facebook page and we’ll see if we can find one in your size.